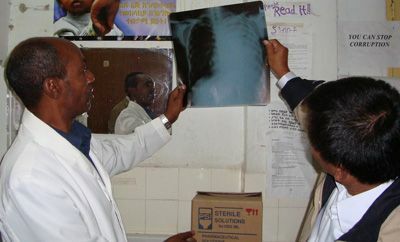 Sok Thim, CHC Executive Director, consults on an xray of a patient with drug-resistant TB with Dr. Bekele, the Assistant Director of St. Peter’s TB Hospital in Addis Ababa in September 2008. The xray shows that TB has totally impaired one of the patient’s lungs. Boston, MA-- The Global Health Committee (GHC) has announced it will receive $2 million dollars from the Jolie-Pitt Foundation to bring life-saving medicines to Ethiopians suffering from HIV/AIDS and tuberculosis. The money will be used to create a center for AIDS and tuberculosis-affected children in the capital city of Addis Ababa, and to help establish a program to treat drug-resistant tuberculosis in children and adults. The Global Health Committee (www.globalhealthcommittee.org) is an operational expansion of the Cambodian Health Committee, a non-profit, nongovernmental organization founded in 1994 to deliver life-saving medicines, poverty-reduction microcredit programs and pioneering community-based approaches to treat TB and AIDS to the people of Cambodia. With its roots in the “killing fields” refugee camps on the Thai-Cambodian border, the CHC’s pioneering approaches have shown that impoverished people living on less than $1 a day, even in a war zone, can follow complex medication regimens and achieve cures if given access to medicines and proper medical support and education. The Jolie-Pitt gift will allow the Global Health Committee to replicate the CHC’s unique blend of delivery of care, basic scientific discovery and advocacy in Ethiopia, a country struggling with the global and linked health crises of tuberculosis and AIDS. Ethiopia has the seventh highest tuberculosis burden in the world and has an estimated 1.7 million people who are infected with HIV, according to the World Health Organization. UNICEF estimates that there are over 900,000 children who have been orphaned by AIDS in Ethiopia. The Ethiopian children’s center will be modeled after the Cambodian Health Committee’s Maddox Chivan Children’s Center in Phnom Penh, Cambodia. That center, also supported by the Jolie-Pitt Foundation, currently serves children who either have HIV/AIDS, or have been orphaned or suffered other family disruptions due to AIDS and TB. The children receive an integrated program of medical, educational, and social services. The center was opened in February 2006 and currently over 350 children benefit from the center's integrated program of medical, educational, and social services, at no cost to families. Dramatic improvements in both the medical status as well as in educational levels of children whose educations had been disrupted due to their own or their family's illness have been achieved. “Our goal is to transfer the success we have had in Cambodia to Ethiopia where people are needlessly dying of tuberculosis, a curable disease, and HIV/AIDS, a treatable disease,” said Angelina Jolie. The clinic in Addis will be named after the couple’s Ethiopian adopted daughter Zahara. "It is our hope when Zahara is older she will take responsibility of the clinic and continue its mission" said Brad Pitt. With support of the Jolie-Pitt gift, the GHC will also transfer CHC’s approach to TB care to Ethiopia where it will work with the Ethiopian Federal Ministry of Health, WHO and other partners to begin the first treatment program for drug-resistant TB in Ethiopia. Tuberculosis causes approximately 2 million deaths a year and is the largest cause of death worldwide for children and adults with AIDS, even though it is curable. drug-resistant TB does not respond to the standard six-month course of antibiotics, and curing the infection requires longer treatment (up to 2 years) with prohibitively expensive drugs that have many side effects. The World Health Organization estimates that there are approximately 6000 cases of drug-resistant TB in Ethiopia, yet at this time there is no access to the drugs needed to cure the disease. “The fact that poor people continue to die in our world today of TB, a curable disease, because of lack of access to drugs and care is unacceptable” said Pitt. About the Global Health Committee (GHC): As the Cambodian Health Committee, the GHC (www.globalhealthcommittee.org) has treated and cured thousands of Cambodians of tuberculosis and provides HIV/AIDS care for thousands more. At its core is the conviction that all people, no matter where they live or how much money they have, deserve a chance to lead healthy lives. The CHC has pioneered unique delivery models of care for TB and AIDS that reach the poorest citizens, including for drug-resistant TB. Linked to that care is basic scientific discovery conducted at the Immune Disease Institute, a Harvard Medical School affiliate aimed at improving the ability to treat TB and AIDS in the future. The CHC’s clinical TB and AIDS programs, which involve outreach, training, intensive patient and family support, microcredit and poverty reduction and the creation of centers of excellence for TB and AIDS care, have been scaled up by the Cambodian government and are used by governments and NGOs in many countries of the world. The adoption of the GHC name signifies the expansion of CHC operational activities and its unique approach of treatment, research and advocacy beyond Cambodia’s borders to other countries, starting with Ethiopia.